We are quickly approaching the end of May, which means it's time for my next monthly favorites post. May was filled with a lot of ups and downs; however, I did graduate college and spent lots of time with friends and family which was uplifting. Without further ado, lets jump into my favorites! 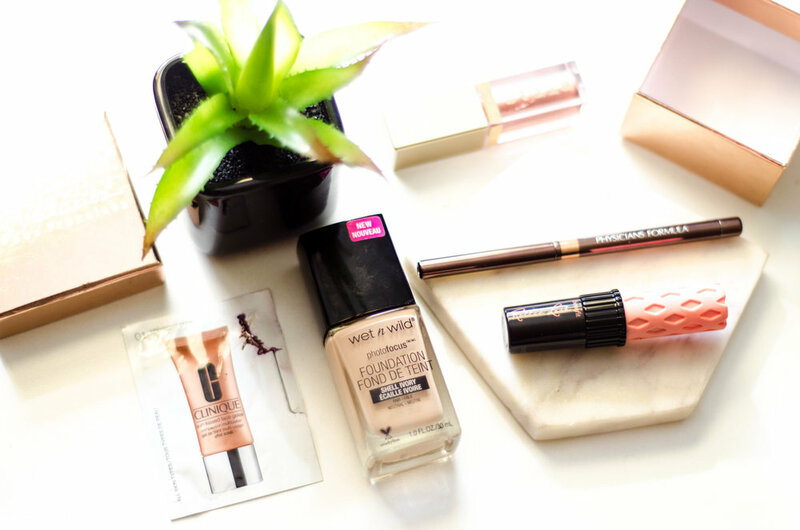 Wet N Wild Photofocus Foundation: This foundation has quickly become one of my everyday foundations. I really love the medium coverage it gives me as well as its satiny finish. I've had some skin issues due to stress this month, and it's done a good job at covering up the redness I get around my breakout areas. I also mentioned how I disliked the applicator in my review of this foundation, but it's actually grown on me since then - it allows me to paint a couple of foundation stripes across my face then blend with my beauty blender super efficiently. Clinique Sun-Kissed Face Gelee: As you can see in my photo, this sample was quite well-loved by me this month. This is a liquid bronzer that initially looks super intimidating, as it's really dark in color. It actually reminds me of a self-tanner upon initial inspection. However, this blends out seamlessly to give me such a lovely sun-kissed bronze goddess glow. I will definitely be repurchasing this as it's perfect for the upcoming summer season! Benefit Roller Lash Mascara: I really love using this mascara on days where I want to add more length to my lashes. It curls and separates them so well and makes them look miles longer than they actually are. Although this is not the dramatic volumizing mascara I typically go for, the length this one adds to my short and sparse lashes makes up for that by leaps and bounds. If you're a fan of more natural looking lashes, this mascara is for you. Brown eyeliner: This month I've been creating more natural eye looks than I normally do. A lot of days I even opted out of eyeshadow and winged liner altogether. Instead, I started tightlining with brown eyeliner and then applying my Roller Lash mascara. The eyeliner I used this month was a brown one from the Physicians Formula Shimmer Strips Eye Enhancing Eyeliner Trio. It has some nice subtle sparkles, goes on smoothly, and is quite pigmented. The only drawback is I do experience some minor transferring to my upper eyelid by the end of the day if I'm not wearing primer. Stila Magnificent Metals Glitter & Glow Liquid Eyeshadow in Kitten Karma: I know I've already talked about this eyeshadow several times on the blog, but it deserves to be praised once again! This eyeshadow is so easy to use and creates a flawless, fabulously sparkly look in minutes. It's completely revolutionized the feasibility of using glitter for even makeup novices. Expect to see more of this in the future, as I'll definitely be purchasing a few more asap! Which products were you loving this month? Leave a comment below!